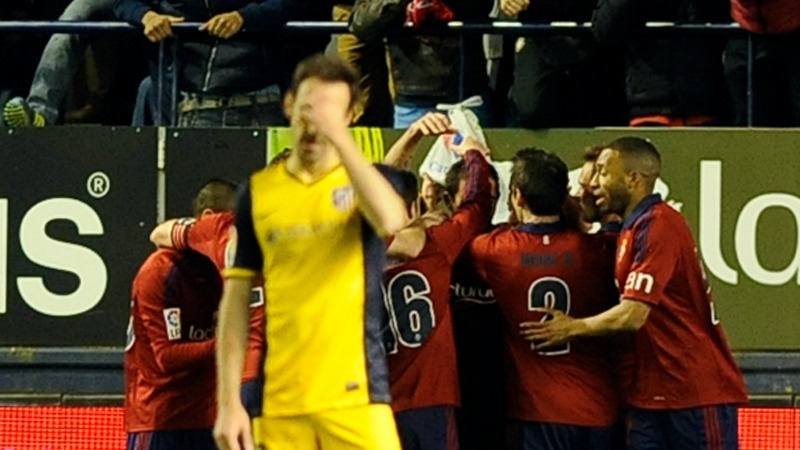 Osasuna pulled off one of the shocks of the Primera Division season as they thrashed title-chasing Atletico Madrid 3-0 in Pamplona. Atletico were much changed but still expected to cast Javi Gracia’s men aside and draw level with city rivals Real Madrid – who they host next weekend – at the top of the table. Instead they were three down inside a breathless opening half as they were stunned by goals from Alvaro Cejudo, Emiliano Armenteros and Roberto Torres. All of the goals were preventable and while Atletico improved marginally after the break, a deserving Osasuna had already inflicted too much damage. Coach Diego Simeone’s decision to make five changes from the team that won 1-0 away to AC Milan in the Champions League in midweek therefore appeared to backfire, although he did still include top scorer Diego Costa alongside David Villa up front. It was in defence, however, that Atletico were most obviously laboured and, after a fourth defeat in their past six games in all competitions, Simeone has work to do ahead of a Madrid derby next weekend that has now taken on even more importance for his side. Atletico will go into the match three points behind Real, who end the weekend clear at the top after Barcelona also suffered a surprise defeat, 3-1 at Real Socieded on Saturday. Both Barca and Real had already failed to win at Osasuna this season, despite Gracia’s side sitting only just above the relegation places, and Atletico were quickly on course to join them. Osasuna took just six minutes to forge ahead when Atletico’s entire defence was fooled by a training-ground corner routine. Cejudo was allowed to ghost into the area and volley home at the back-post completely unmarked after the away defence were drawn into marking the dummy runs that provided him with an embarrassing amount of space in behind them. Atletico may have still been expected to recover, but were 2-0 down on 21 minutes thanks to a cracking Armenteros 25-yard drive that flew in off the post. There was little Atletico goalkeeper Thibaut Courtois could do about it although his defence were culpable after Armenteros latched onto a poor clearance before taking two touches and pulling the trigger. Osasuna’s dream opening 45 minutes was then complete just before the break when more ponderous defending allowed Torres to head Abella Damia’s left-wing cross in at the near post. The midfielder did not have to jump to get on the end of the delivery as the static Atletico defenders watched on. The expected Atletico fightback never materialised after the break with Osasuna goalkeeper Andres hardly tested as he kept a memorable clean sheet. Substitute Raul Garcia volleyed wide from an acute angle before forcing the goalkeeper to make a brave block at his feet, but otherwise Osasuna ably kept their more fancied rivals at bay to move up to 12th place and seven points clear of the bottom three.